What if I wanted some trendy clothes this autumn ? 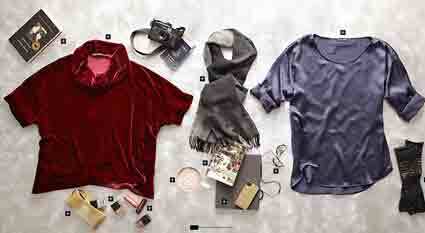 I fell in love with the Cosy Fall Wish List suggested by The Blush Chronicles. Of course use your own best colours. – some other sources of wearable trendy inspiration for this winter. 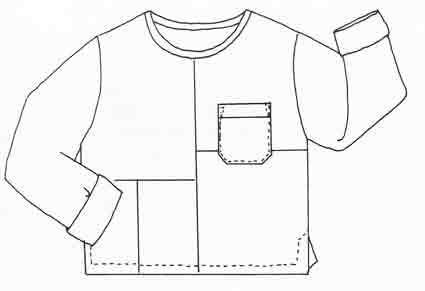 Pair with the ubiquitous slim pants, such as Palmer-Pletsch McCall’s 6440. Though I wouldn’t wear this in leather. Not for moral reasons, I’m just not happy in heavy stiffness. 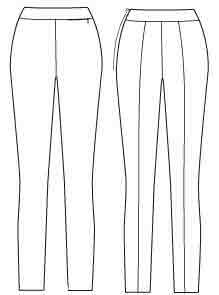 With my rear, I don’t look good in a short fitted jacket and pants, so would add a long straight skirt. 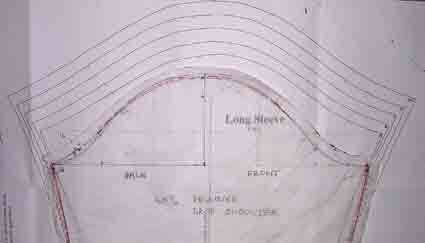 Use the best length for you. 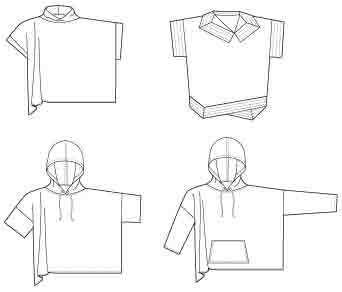 Wearable with both jacket and sweater. Perhaps the one in Vogue 8841. No pattern exactly the same as the inspiration. A bit of pattern work needed here. 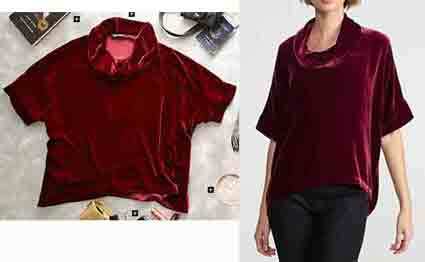 There is a recently oop cape-sleeved coat pattern, Vogue 8678. But there isn’t much of the year when I would be happy in a coat without full length sleeves ! 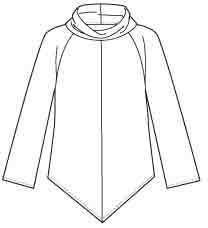 So add some capelet pieces to a shoulder princess coat, as in the inspiration. 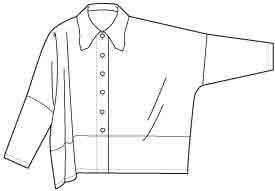 Perhaps start from Burda 7855. 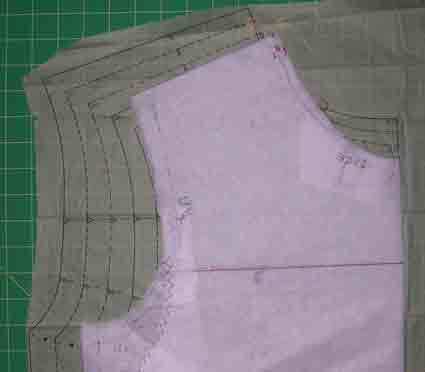 Try a mock-up of the capelet pattern pieces to get the length and width you want, starting with a half circle. 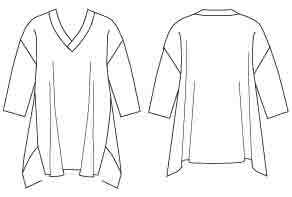 Or adapt from a cape style with shaped shoulder seam, such as Vogue 6776 (better for getting the cape hem on-grain). The cape-coat inspiration is double breasted. 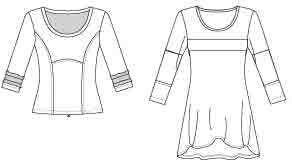 One of the many advantages of a shoulder princess pattern is – it’s easy to adapt the centre front panel to different styles. 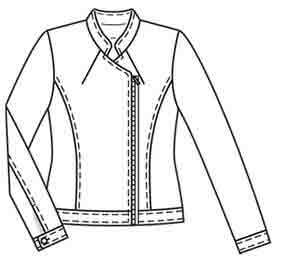 And the inspiration has a trench style collar. 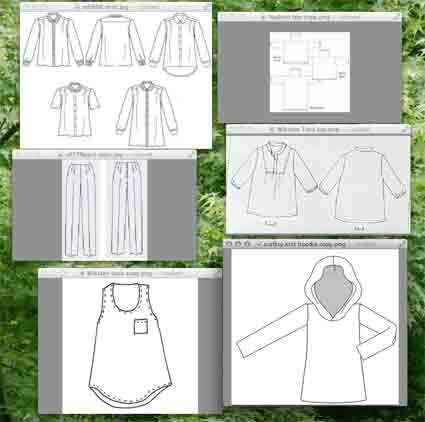 So swap the notched collar and front opening of the Burda coat for something like McCall’s 5525, View D.
To combine the patterns – overlay the front pattern pieces and match up the shoulder seams and centre fronts. 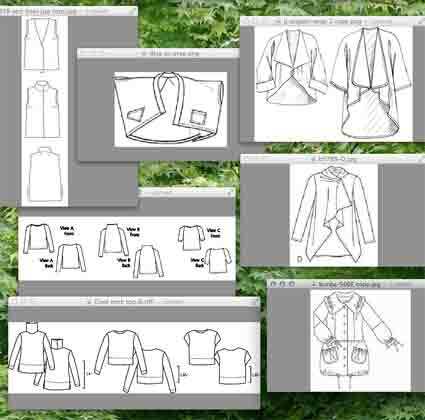 Then trace the style elements you want. 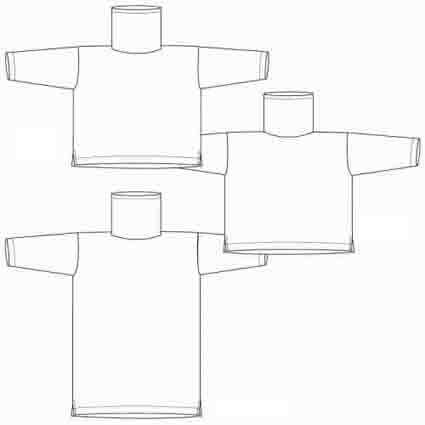 Do the same with the back pattern pieces to check if the back neck shapes are different. 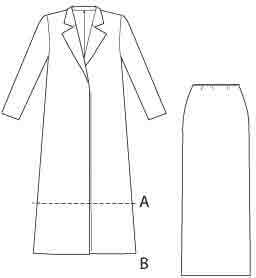 Straighten out the front edge and add more buttons, if you want your coat to close up to the neck. 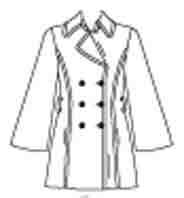 Or simply use this trench style in dark fabric with military buttons for another of this season’s coat looks. 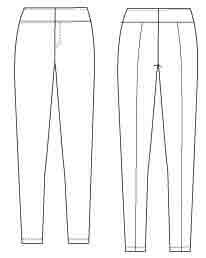 – second pair of pants – straight leg or boot-cut. 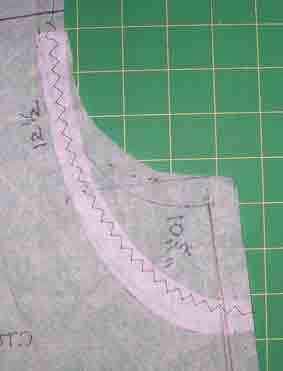 And a self-fabric strip for one of the blouses/ shirts so you have a bow-neck look. All in basic shapes. Vary the surfaces and textures. 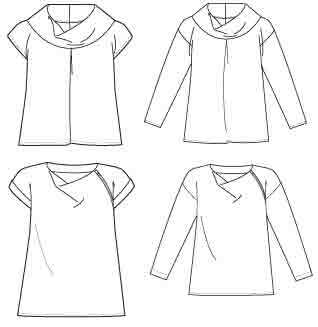 3 tops (long sleeved tee, long and short sleeved blouses). 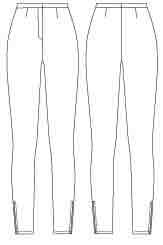 3 bottoms (2 pants, 1 skirt). 10 garments in all. 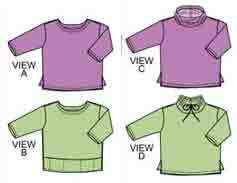 The 9 indoor clothes give about 40 outfits if they all co-ordinate. Haven’t mentioned the shoes 😀 That’s the one piece of the starter capsule that I already have, as flat ankle boots are a favourite of mine. Many people round here are wearing knee high boots with their slim pants. Add a dressier pair of shoes to increase the range of opportunities for wearing these clothes. You haven’t got to wear the current sky-high stiletto heels to look dressy. Try pretty ankle boots with medium heels. Or decorated ballet flats. Add some indoor and outdoor scarves, a narrow waist belt, warm hat and gloves, favourite jewellery. For easy-wear current looks in ‘modern classic’ style, see YouLookFab’s Pinterest board – copy many of these outfits using this wardrobe, and her comments on what she’s wearing this season. 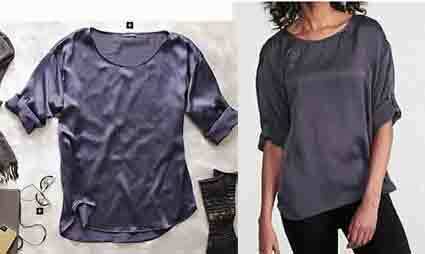 And here’s a list of current items from StyleMakeover. For a wide range of current styles, see Nancy Nix-Rice on wearable current trends and suggested outfits (no they’re not the pure classic styles which she uses to illustrate her wardrobe planning posts). Next stage of additions : add blazer, cascade jacket, big top to your wardrobe, and you can mimic many of these outfits too. Enjoy the new season !